Preheat oven to 400̊. Roll out your pizza dough and using a pizza cutter, cut in 1 inch strips. Cut pepperoni sticks and/or Italian sausage links in half. Sprinkle Mozzarella over all of the pizza dough. 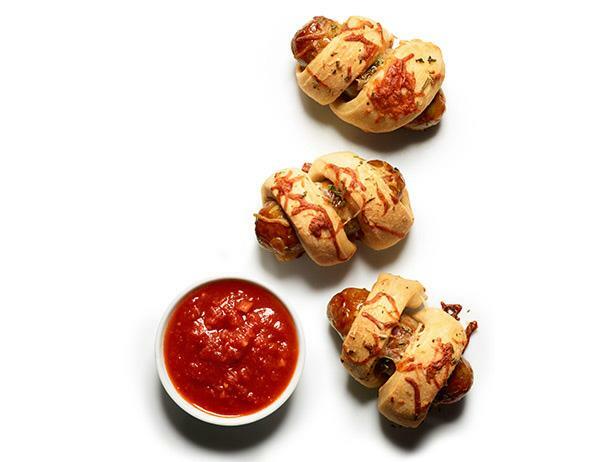 Roll up the sticks and/or sausages in the dough and place seam down on a greased cookie sheet. Sprinkle with Parmesan cheese. Bake for 12-15 minutes or until dough is cooked and browning. Serve warm and ready to dip in your favorite warmed up Cannizzaro Sauce!